Kara Tippetts knows the ordinary days of mothering four kids, the joy of watching her children grow … and the devestating reality of stage-four cancer. In The Hardest Peace, Kara doesn’t offer answers for when living is hard, but she asks us to join her in moving away from fear and control and toward peace and grace. Most of all, she draws us back to the God who is with us, in the mundane and the suffering, and who shapes even our pain into beauty. When I was introduced to this book, I thought, “Not another cancer story.” I am NOT making light of cancer. I have suffered the loss of many family and friends who were taken by cancer. Reading the stories are not easy. I feel the pain and suffering of each word when I read these kind of books. Well, this book is not like that! It is so much different than any of the other cancer survivor stories that I have read. God’s grace. His wonderful unfailing grace and love throughout Kara’s life is the focus of this story. If you follow Kara’s blog or heard her speak, I believe you will be incredibly blessed by this book and her journey. When someone is diagnosed with cancer, it can be earth shattering. All their hopes, plans and dreams come crashing down. How does a person who is diagnosed with cancer react? How does their family react? Do they stomp and snort? Are they mad at the world? Do live the rest of their lives asking why? It is understandable to ask any of these questions and many more. 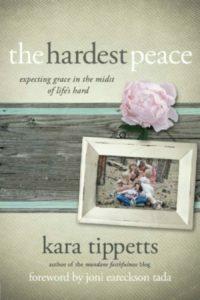 In “The Hardest Peace” Kara speaks to us and gets right to the core. She talks about how she needed to let go of the “idols” she dreamed and planned for and instead embrace God’s plan. Sometimes it takes a significant, life altering event to redirect our focus on God. We can get caught up in our 5 and 10 year plans, our checklists, that we forget it is God who has the plan for our life. How do we find the love, joy and tranquility in the small things in our life? Is it possible to find the joy in mundane chores like folding laundry, washing dishes or mowing the yard? Do we take time to snuggle with our kids? What about teaching our children to ride a bike or catch a ball? Do we view these things as a joy or simply a chore? This book will encourage all who read it to find more joy in those little things and to embrace life and God’s calling for our life. This book will also show us all the wonderful beauty in the midst of deep hardship and pain. Although I just received my copy of “The Hardest Peace” the other day, I couldn’t put it down. I was consumed by Kara’s life and her words. She has written a beautiful and intriguing story! The majority of the books written by or about cancer survivors often talk about God. However, Karen’s book doesn’t stop with just talking about God, she shows the reader the Gospel. Her devotion and her hope throughout her pain is an inspiration. I urge you all to pick up a copy of The Hardest Peace. You will be blessed. Also, below I have a giveaway! Previous Post: « Timberdoodle $300 Gift Card GIVEAWAY!! !